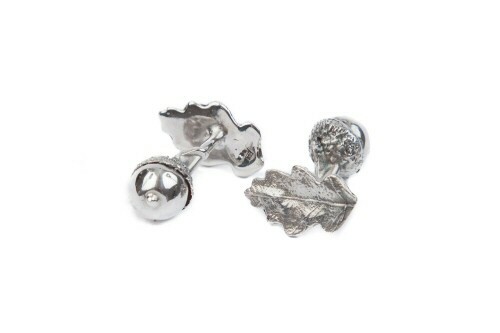 These cufflinks feature a rounded acorn on one side and a beautifully detailed oak leaf on the other. It is the acorn that is pushed through the button hole to be worn, leaving the oak leaf on the opposite side of the cuff. The cufflinks have a lovely weight, each is hallmarked, the acorn cup and oak leaf are slightly darkened bofore a final polish to highlight the finest textures from the original natural forms.